Justine: The Earth is evil. We don’t need to grieve for it. Nobody will miss it. Leave it to one of the world’s most infamously melancholic directors, Lars von Trier, to open a film with Earth as we know it coming to an abrupt demise. Dead birds drop from the sky, roots come out from the ground and people sink into the dirt beneath their feet. As disturbing and dark as this grandiose overture is, it is also incredibly beautiful to behold and thus defines the paradox that is Lars von Trier. He gives us nothing but sadness but sees everything, on film anyway, for all its incredible magnificence. 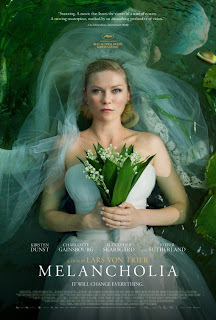 MELANCHOLIA, which von Trier also wrote, tells the story of how a planet of the same name crashes into Earth and destroys mankind. It then rewinds a little to take a closer look at two sisters in the days leading up to the end of the world. First, we get to know Justine (Kirsten Dunst). It is her wedding day, which we all know should be the happiest of her life, but happiness is a constant struggle for Justine. As it becomes clear to her that the end is coming, she becomes less interested in pretending she is in good sorts. Her sister, Claire (Charlotte Gainsbourg), lives a good life with her rich husband (Keifer Sutherland) and passes her time by fussing over details. She is the rock of her family and likely just as depressed as her sister, but incapable of letting that show. As they band together to brave the end, they do great justice to the many faces of misery. Von Trier, who has dealt with depression for most of his life, not only explores the harsh lows of the disease in MELANCHOLIA, but also its lighter side and, more importantly, its futility. Is fighting against the inevitable the best course of action? Or is it better to just give in to your despair and give up all hope for happiness? Von Trier does not pretend to put forth an answer because there is no one answer that matters. The world will end and every single emotion or thought we’ve ever had will cease to exist. Von Trier seems to understand that this is not damnation but rather liberation – that only when we accept that life is meaningless can we truly be free to create the life we want. That’s pretty optimistic coming from a world renowned downer. How many sheep would you give Melancholia? I think you’re spot on with this review. A beautiful text about a beautiful movie. While I don’t think Melancholia will be everyone’s cup of tea, I loved it. The images were breathtaking, and particularly the end was stunning. It didn’t matter that I knew what would happen right from the beginning, I was equally shaken up by it. Even if it’s basically a movie about depression, I actually thought it worked pretty well as an End-of-the-world movie. A very low-tech one. You don’t need a chaotic NASA control room to create the tension. All it takes is a small piece of steel wire. I hope this movie can get some attention now that the director isn’t around pulling it all to himself by odd statements… It was unfortunate, what happened at Cannes. It was a much more human take on the end of the world. No bells and whistles, like you said, just what this family is experiencing. The fact that Lars von Trier does’t travel to North America, it should be a little easier to distance the film from his persona. He recently took back his apology for calling himself a Nazi. He cares more about himself than his films obviously. It’s as if he doesn’t realize or doesn’t care that his actions will impact how many people see this fantastic film.